If you were to offer me something bright, shiny, and new, or, on the other hand, something with the rich patina of age, I would choose the luster of an item that shows signs of life every time. The best example I can give is that of a copper weather vane. I have always loved the verdigris patina of weathered copper. So, when I discovered Modern Masters Metal Effects paints, I just knew I had to explore the possibilities of being able to speed up a process that normally takes place over many years. I was given a custom-made folk art weather vane many years ago. 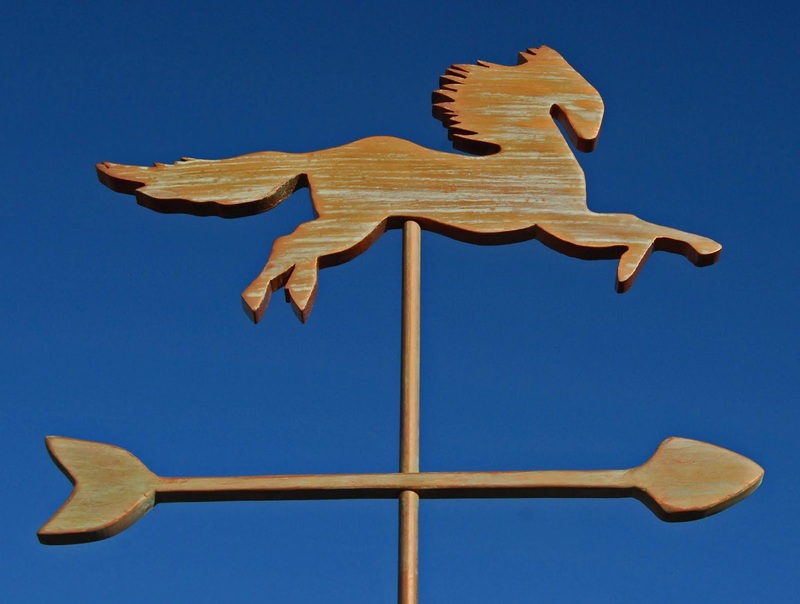 Because of the loveliness of the wood grain, and because I didn't want to risk ruining what was a very meaningful gift, I'd been reluctant to paint or stain the weather vane with ordinary finishes. Until I found the right product, I decided to leave my special art piece unfinished. When I recently came across some online videos of how Modern Masters paints and patina activators had completely transformed normal household items (like vases, frames, furniture, garden statues, and planters), I knew the day had come to give my weather vane the finish it deserved and had waited for all this time. 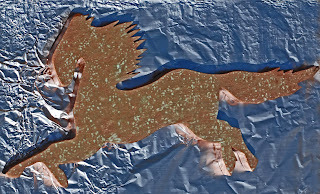 I stopped by Hobby Lobby to pick up the Modern Masters copper paint and green patina kit and got started right away. My first experiment with patina application. You can finish a small project in a couple of days. First, you apply two coats of their uniquely formulated primer. Once those coats have dried, you then apply the first coat of your metal effects paint. For the second application of copper paint, you work quickly to spray on the patina activator while the paint is still wet. Then the really fascinating process begins. Over the course of a few minutes, you will begin to see evidence of oxidation taking place. The green patina begins to appear and will become more visible over the next several hours. Your painted item will become more and more lovely with time. The patina continues to evolve just as it would if you left copper outside to weather naturally. Patina brushed in the direction of the grain. Though I followed the directions, and spritzed on the patina activator as instructed, my first results were not what I wanted. The verdigris patina was too speckled for my taste. I decided to brush on a new coat of copper paint and begin again. That is the beauty of this process: you can redo until you are satisfied. It doesn't take long to figure out what works best given the vision you have for a piece. I found that lightly brushing the wet patina solution in the direction of the wood grain produced the best results. 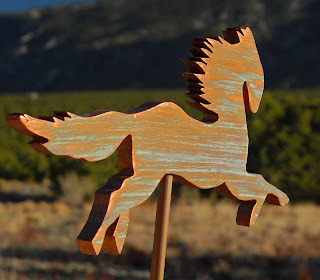 It created a sense of movement and freedom that honors the true spirit of this horse. I have been asked about whether or not the metal effects paint must be sealed. The copper and bronze finishes are self-protective (no topcoat needed). You are encouraged to seal the iron paint with rust patina. There is a Modern Masters product specifically made for that purpose. It is called Permacoat X-Treme Sealer. The wonder of this product is that it works on so many different materials (wood, metal, plastic, stone, paper, etc.). You have the choice of copper, bronze, and iron metal effects, along with green, blue, or rust patina activators. I have purchased all three kits and have more projects currently in progress. At the moment, I am restoring two vintage portholes recovered from ships. They are getting the bronze treatment just as soon as I finish removing all of the salt, rust, paint, and caulk from their surfaces. I will post photos throughout that process. My other ongoing project involves the iron paint with rust activator. I am refinishing some reclaimed doors I purchased from the Habitat for Humanity ReStore. Those doors are going in the She Shed I built a while back. I'll keep you posted with the results of that experiment as I determine which direction I'm heading with that design. I'm thinking I might try a mixed media approach or play with some stencils when activating the patina. And, of course, it won't stop at that. I've been going through my jewelry box with the thought of giving some items a new look. Check out my Pinterest Modern Masters Metal Effects board for inspiration. As you can probably tell, I am totally sold on Modern Masters Metal Effects paints. I highly recommend this creative medium. You can purchase the product in kits or individually. The paints and patina solutions come in a number of different quantities, making it easy and affordable to customize based on the size of your project. 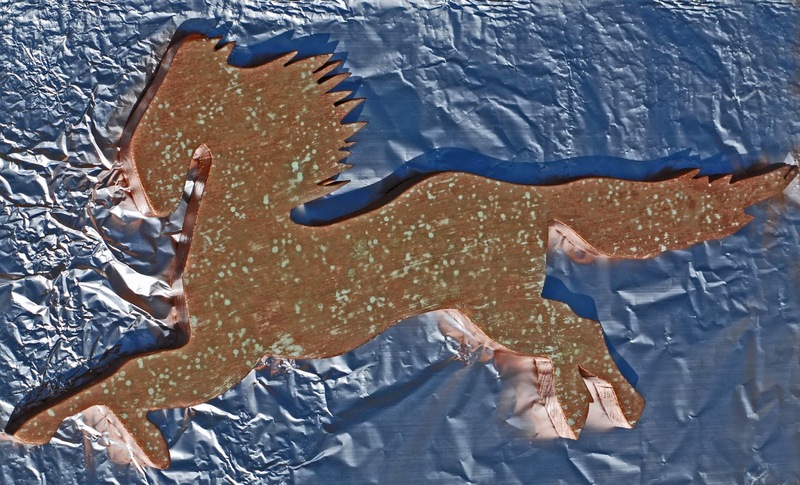 Go have some fun with your own metal effects adventure in patina painting! You will be amazed.